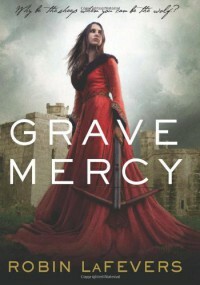 A history of (paraphrased) reader responses to Grave Mercy.Oooh...assassin nuns!Love the historical setting!Yawn. This is boring.The romance is a nicely handled but I wish there was more.I hate that there's even a romance in this book.No, really? Is this book still going?I could eat up every single word on the pages!Maybe there's a few parts which drag but I'm still really liking it.Forget this. I'm done.Polarizing books are nothing new. In fact, I'm almost wary of a popular book if there isn't an ample amount of criticism to temper a mass amount of glowing reviews.So of course, I get to be one of those people who can't come out of the gate with a strong opinion in either direction. I didn't love or hate this book. There were parts that I loved and parts I didn't. I agree with every person who thinks Grave Mercy could have been so much more. This chick was going around and offing people as an agent of Death. I was expecting something a little more epic. "How does one serve Death? "I'm also pretty sure that most everyone who's read this picked the selection for the assassin nun thing. Am I right? In all fairness to the story, I don't think an entire book of assassinations would have gone over well. Could the body count have gone up at least a notch or two? Perhaps. But I can't say that Ismae wasn't assassinating anyone either.I weigh the choice that is no choice at all. To be removed from the world of men and trained to kill them, or to be handed to one like a sheep. "If you think I am fit to serve, Reverend Mother, I will do so gladly. "The parts that I struggled with (as usual for me) involved the politics and planning. Not unlike how I felt while reading Lies of Locke Lamora, I found myself wanting to skim ahead to the action. It's not that anything was wrong, but I have a mind which tends to wander. If I'm having to wait around for people to come to decisions on things, I drift off into thinking about what I need to cook for dinner. Which I did. We had spaghetti tonight. It was nothing fancy, but I also baked a cake because I had some free time on my hands.See? Mind wandering. The amount of romance was actually perfect for me. I didn't think it was too much or too little. Duval is what made the second half of the book entertaining. Men of mystery and intrigue are always appreciated.The first 25 and last 25% were excellent. It was that pesky middle section which had me struggling to pick the book back up. I'm not sure what could have been done differently but the pacing felt skewed somehow.I hear Sybella's installment (book 2) is quite a bit better, so I will be looking forward to it. Even with some complaints, I still enjoyed watching an assassin nun at work for death, so I'll be heading back to this world at some point.Many of you know that I can't seem to avoid noticing random things in books which make me laugh. Here's my latest find : The two men draw together, silent but deadly, as their companion writhes on the ground.